Welcome to our weekly One Minute Monday blog, where we outline a statistic or fact from our research in under 60 seconds! Our Employer Skills Survey 2015 found that the number of job vacancies that are hard to fill due to a lack of available skills (skills shortage vacancies, or SSVs) has increased by 130% in the last four years. But what is the effect of these skill shortages on UK businesses? In our interviews with those employers who had difficulty filling vacancies, 84% said the impact of not being able to fill those roles was an increased workload for other staff. 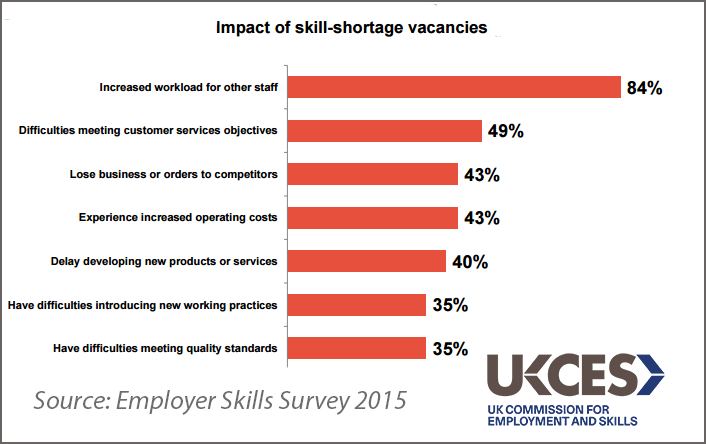 Nearly half (49%) said skill shortage vacancies had caused difficulties meeting customer services objectives. Other areas of impact employers listed included loss of business to competitors, increased operating costs and difficulties in meeting quality standards. Simply put, employers recognise that skill shortages in the UK labour market are impacting their bottom line. Read the full report to find out more about the findings of our UK Employer Skills Survey 2015.